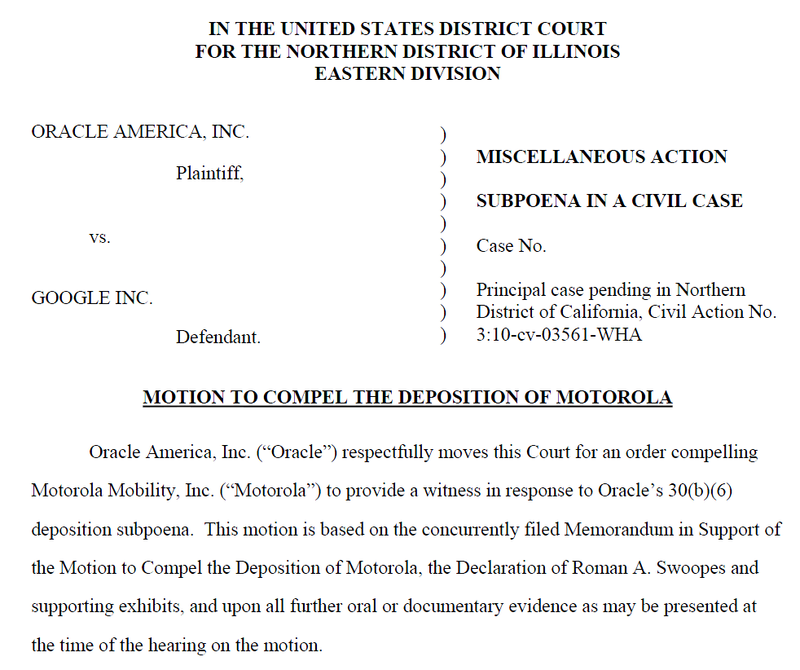 Oracle's lawsuit against Google has been going on for almost exactly a year before the U.S. District Court for the Northern District of California (San Francisco), and one particular element of the dispute -- a motion to compel a deposition of Motorola Mobility -- has just been filed with the Chicago-based Eastern Division of the U.S. District Court for the Northern District of Illinois. Each package and source code file Motorola retrieves from http://android.git.kernel.org for loading, installation, or execution on Motorola Android Devices, and any changes Motorola makes to those packages and source code files. The extent to which Motorola uses the Android dx tool, and whether Motorola has made any modifications to that tool. "Google has developed the Android operating system and platform for mobile devices, relying heavily on Java technology but without licensing Java intellectual property. Google actively distributes Android and promotes its use by manufacturers of mobile devices and application developers. Motorola is one such manufacturer of Android devices. Motorola manufactures and sells mobile devices installed with Android software. Examples of Motorola Android devices include the Atrix 4G, Cliq, Cliq 2, Droid 2, Droid Pro, Droid X, Droid, Bravo, Flipside, Citrus, Defy, Charm, Backflip, Devour, and Xoom. Oracle seeks to depose Motorola to confirm that the Android software is installed on Motorola’s Android devices and to determine if any changes have been made to the software. Oracle further seeks to confirm that Motorola uses the accused technology in developing applications for Android." "[...] Oracle verifies that it has consulted with Motorola by telephone and email, and has made good faith attempts to resolve this matter with Motorola but was unable to do so." "Motorola's counsel producted [on June 15, 2011] a single document that appeared to be a log of changes that have been made to some undefined set of Motorola’s Android software. The log is the only technical document that Motorola has produced to date. The log, on its own, did not provide sufficient detail to determine whether the referenced software has been incorporated into any Motorola Android devices. The log, on its own, did not provide sufficient detail to determine the origin of the referenced software--whether from http://android.git.kernel.org, as described in Oracle's request for production no. 4, or from another source. The log, on its own, did not provide sufficient detail to identify the changes that Motorola made at the package or file level, as described in Oracle's request for production no. 4." 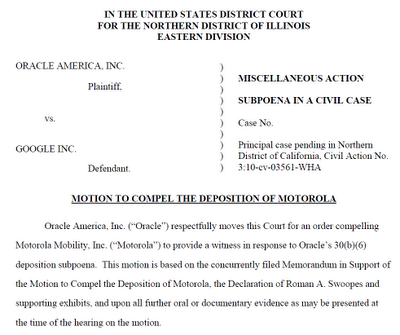 As a major Android device makers, Motorola obviously would like Google to fend off Oracle's lawsuit. A recent media report quoted an analyst as saying that Oracle is -- in parallel to its ongoing litigation against Google -- in talks with Android device makers, demanding royalties amounting to "$15 or $20 per handset". Motorola may have been approached by Oracle -- or otherwise may expect to be approached anytime -- with the same desire. I believe what Oracle wants to know from Motorola is very reasonable. It's definitely relevant to the dispute and it doesn't seem too burdensome a request. I venture to guess that the Chicago-based court will grant this motion to compel Motorola's testimony.